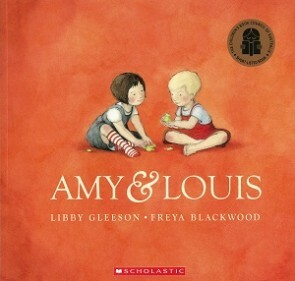 Amy and Louis are best friends. They live next door to each other. When they want to play they call to each other across the room, across the yard or across the fence using a special word Amy’s mother taught her – Coo-ee. The games they play are richly imaginative. They build castles out of cardboard and see magical creatures in the clouds. Then one day Amy’s family moves house, not just to another suburb but to a city on the other side of the world. They miss each other and the games they shared. Louis thinks that if he calls loudly enough Amy will hear him but his parents tell him that Amy is too far away. Only his grandmother encourages him to try and their special connection is re-established.